Dispelling keto misinformation and helping you lose fat. It’s no secret that a ketogenic diet turns ones body into a fat-burning machine. With many proven benefits such as weight loss, improved cognitive function, possible treatment of major diseases, improved health, and significant performance benefits, you’d be quick to wonder why you haven’t dived in just yet. Bottom line? 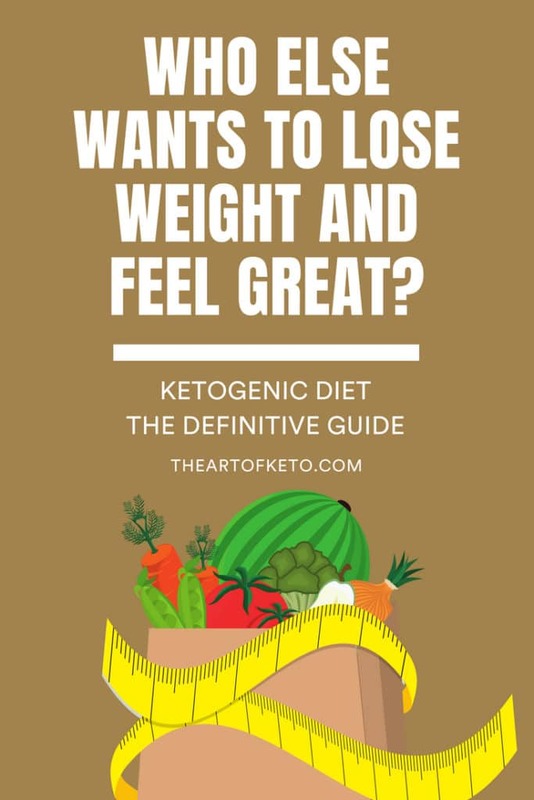 If you’re ready to dive into the ketogenic lifestyle, this guide will show you everything you need to to know to get started. but first click here => 1I am a footnote. Every time you see one of these gems you can click it to perhaps learn a bit more, read my thoughts, or to reference a study. Don't have time to read all 5,000 words? Download a PDF to read offline at a later time. What if you don't want to test? Chapter 6: What do you eat on a ketogenic diet? Are there any side effects on keto? Ketosis is when your body’s metabolism shifts away from glucose / sugar (carbohydrates) towards mainly ketone / fat utilization. Essentially, the ketogenic diet triggers the production of ketone bodies by the liver. The tipping point to a ketogenic diet is how much carbohydrates are restricted, causing a series of adaptations to take place. Ketones (or ketone bodies) are the byproduct of the incomplete breakdown of free fatty acids (FFA) in the liver. Under “normal” dietary conditions, the body draws energy from all of the macronutrients (carbohydrates, protein, and fat) When you restrict carbohydrates or remove them all together, the body is forced to find an alternative fuel to provide energy. One of which is free fatty acids (FFA) Most tissues in the body are capable of using FFA, but a select few major organs cannot – most notably the brain and nervous system. However, break down those FFAs and now, the brain and other tissues can utilize ketones. In fact, ketone bodies may be a preferred fuel source for the brain over glucose due to greater energy efficiency. This may explain the improved cognitive function many experiences on a ketogenic diet. Now that you have a basic understanding of what ketosis is and what ketones are, how can this benefit YOU? Everyone has their own reason for going keto, even you. While keto may not be the easiest diet to get started on due to years of various eating habits we’ve accumulated, it offers a TON of benefits if you’re willing to commit. If you’re willing to give keto a fair shot you can look forward to feeling amazing, looking fantastic (more fantastic), and possibly recover from chronic health issues you may be plagued with. 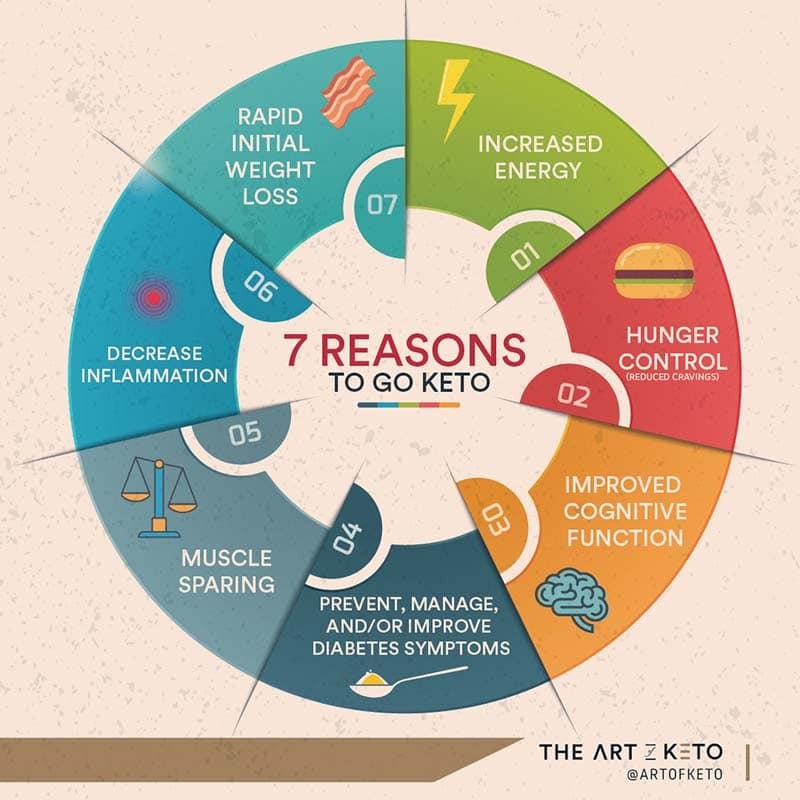 Here are a few of the benefits of a ketogenic diet. One of the biggest benefits of the ketogenic diet may be its effectiveness in massive weight loss. Ketosis isn’t “magic,” though some would say that it is; instead, it generates a combo of synergistic effects that make dieting easier for the individual. This is important because the overwhelming drive to eat as a result of cravings when dieting is the BIGGEST impediment to weight/fat loss, and the reason why most diets fail. At the end of the day, almost all diets will work, but if you can’t keep it off then what’s the point? We’re after both effectiveness and sustainability. Once your body has shifted to utilizing ketones for energy you’ll begin to notice increased, uniform energy throughout the day. This is why many people claim feelings of mental clarity on a ketogenic diet. In adults with bad memory, adding ketones improves cognition. In fact, the higher the ketones, the higher the scores. Many people also report a sense of euphoria and well-being, which I too have noticed. Moreover, many individuals use keto diets specifically for the sole purpose of increased mental performance. Ketogenic diets increase energy efficiency. At any given intensity, a keto-adapted athlete will burn more fat and less carbohydrate (glycogen) than not keto-adapted athletes. This allows glycogen to be spared for when we really need it. Our bodies store glycogen (sugar) in our muscles and liver, but there is an upper limit of approximately 2000 – 2500 calories. This is why you may see, or have experienced, hitting “the wall” during prolonged endurance events such as a marathon or ultra-marathon. Your body simply runs out of its stored energy. This wouldn’t be the case if you were fat adapted (keto-adapted) The below table illustrates that carbohydrate stores are minimal compared to protein or fat. The average person has enough energy stored as body fat to exist for weeks, even months, without food intake. By no means is this an endorsement to forego any treatment or not seek medical help. Always seek professional help if you are suffering from a disease. Since a ketogenic diet manages blood sugars fairly well, it is excellent for prevention, managing, and even possibly reversing type 2 diabetes and pre-diabetes. The ketogenic diet first emerged as a tool for clinicians to treat patients with epilepsy. It remains the only method with the consistent ability to prevent seizures through a variety of mechanisms. As you can see, a ketogenic diet provides a slew of benefits with very minimal, if any negative effects. Now that you have a general understanding of what a ketogenic diet is and how it may benefit you, The next chapter will discuss the how. We will show you how to get started and set up your diet for success based on your goals. There are right ways, yes… ways as in more than one, and wrong ways to implement a keto diet. What’s wrong or right is subjective, of course. BEFORE GETTING STARTED As always, you should always consult with a medical professional before starting any diet. Type 1 diabetics and diabetics taking medication. While the above groups MAY be able to safely employ a ketogenic diet, it is advised you do so under close medical supervision. In general, while a ketogenic diet is nearly the same for everyone in how it is set up, those using the diet to treat serious neurological diseases want to maintain high levels of blood ketones. This means sticking to very low carb AND erring on the side of lower protein ~10-15% of calories. Then again, if this applies to you then please consult your physician or another qualified medical professional. For those doing keto for general health, weight loss, and/or performance, you may be able to handle more protein and/or carbohydrates and still remain in ketosis. For now, let’s get to the nuts and bolts of the diet. A ketogenic diet is a major change for some, if not most people. You’re literally telling your body to switch over from one fuel source to another. It’s like taking your car’s petrol engine and switching it to a diesel engine. 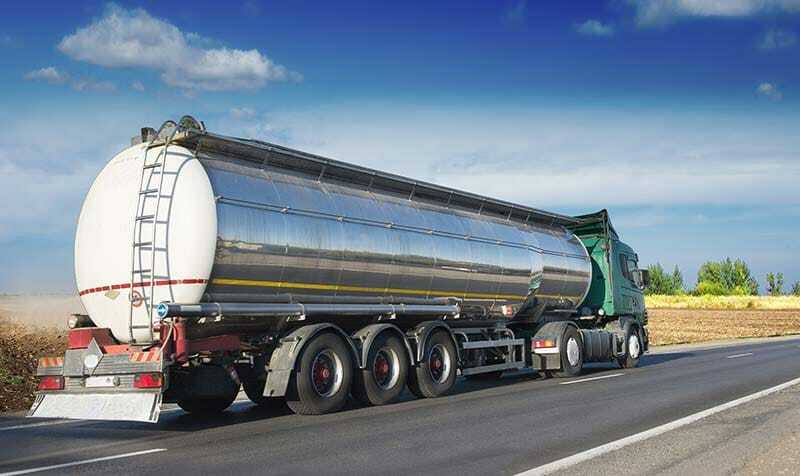 Or better yet, strapping a tanker truck to you with unlimited energy. With that being said, it may take some getting used to. Make sure you are well prepared both mentally and physically on the journey you are about to embark on. My top 3 recommendations to ease your transition and make it as enjoyable as possible. (sodium, potassium, magnesium) You can easily accomplish this by salting your foods liberally and eating foods rich in potassium and magnesium such as leafy greens or avocados. You can also achieve this by supplementing electrolytes as well. While this may slow fat loss down if that is your intended purpose, increasing fat can accelerate keto-adaptation. Of course, dial it down after you’re adapted according to your goals. Exactly how much fat you should eat on a ketogenic diet will inevitably be determined by your overall calorie intake and other macronutrients. Lift weights and perform a low-level aerobic activity. Why? because it’s good for you that’s why. Ok, I said 3… but lastly, make a minimum commitment of 4-6 weeks. Everyone responds differently to the diet. The first couple of weeks may be difficult for some, while a breeze for others. In my experience, the longer you’re on the diet the more benefits and breakthroughs you will experience in health, weight loss, and performance. Just because the ketogenic diet is a “high-fat” diet doesn’t mean you have an all-access pass to eat unlimited quantities of fat. Establishing a metabolic state of ketosis is more about the lack of carbohydrates, not eating copious amounts of fat. By default, a ketogenic diet is considered a “high fat” diet because once protein intake is calculated and carbohydrates are restricted, the remaining calories will be comprised of fat calories. 5-10% of calories coming from carbohydrates. In general, the guideline for a ketogenic diet, keto diet, ketosis diet is high fat, moderate to low protein, and low to no carb. The amount of calories boils down to what your goals are concerning fat loss or muscle gain. If you are looking to lose fat you want to eat less than your body burns on a daily basis to be in a negative energy balance. When trying to put on muscle, you want to eat more than your body burns on a regular basis to be in a positive energy balance. 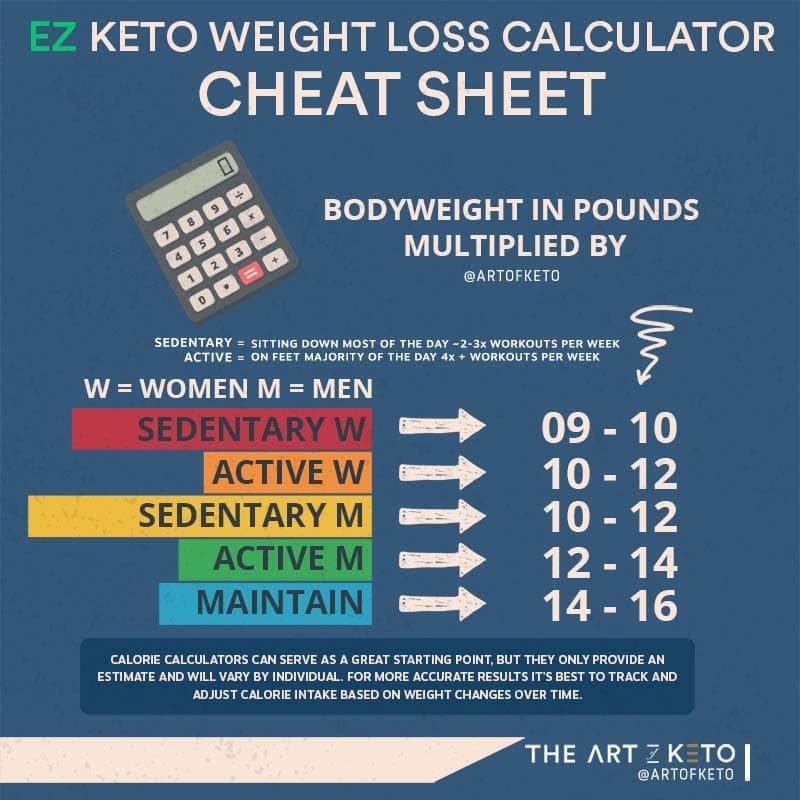 To give you a general starting point and a better understanding of tracking calories you can see the what and how many calories you should eat on a ketogenic diet? 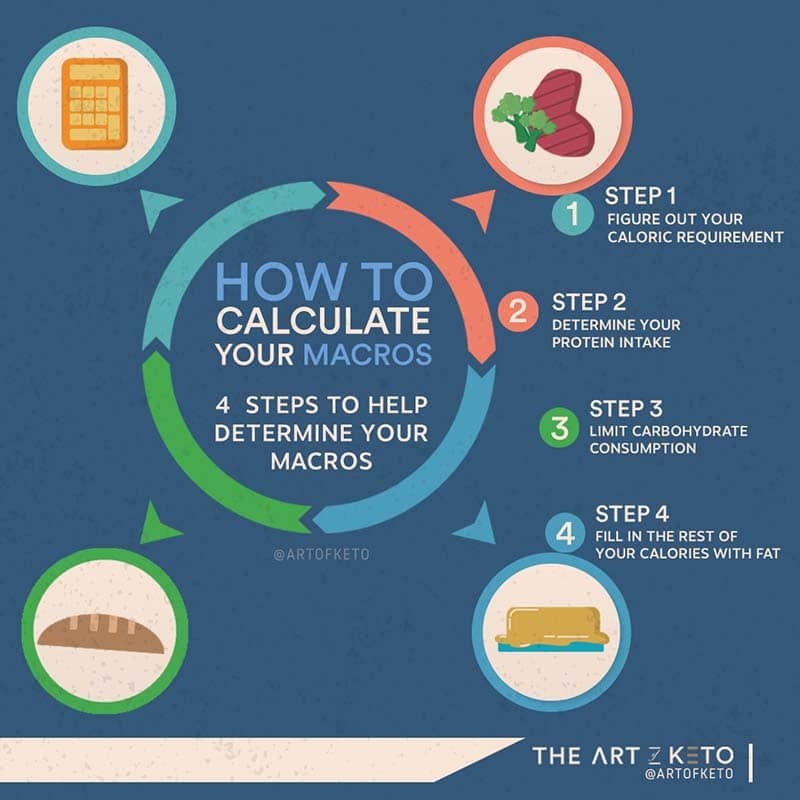 Or if you prefer plug and play visit our handy keto macro calculator that will help individualize a breakdown that fits your preferences and goals. You will see a lot of conflicting information when it comes to a keto diet macro breakdown. 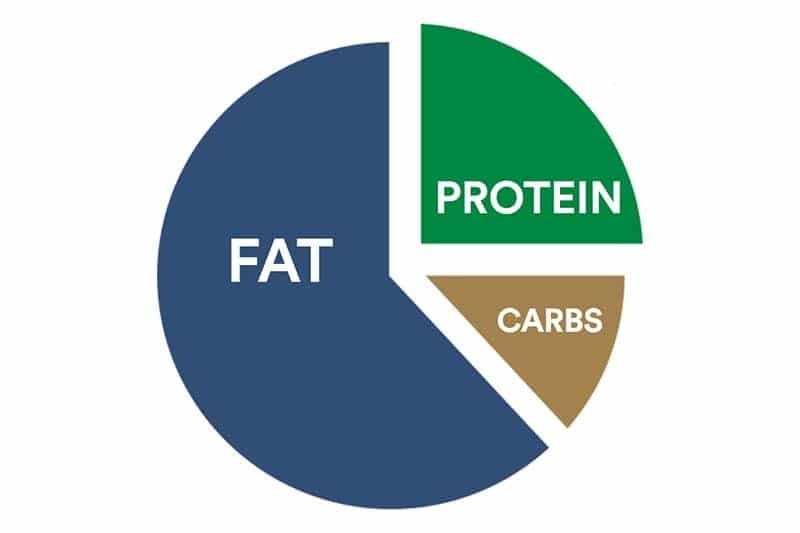 As stated previously, the percentage breakdown usually is a byproduct of setting our protein and carbohydrate targets first. With that said, we shouldn't look to strive for a certain percentage of any macronutrient (carbohydrates, protein, or fat) albeit unless the use of a ketogenic diet is for therapeutic purposes where the percentages originated. One of the main reasons you should not base your diet on percentages is better understood given our recommendations of how much protein should you eat on a ketogenic diet which is based on a person's lean body mass (total weight – fat weight). Someone who carries more muscle and lives a highly active lifestyle given the same weight as another individual who is inactive and has a higher bodyfat would have a higher need for protein and likely carbohydrates. STEP 3: Track and adjust. As with any new endeavor, you want to make sure you are heading in the right direction. What gets measured get's managed. It shouldn't matter if you're using a ketogenic diet for fat loss, muscle gain, improved cognitive function, or decreased inflammation… make a note of any changes you observe. The only way to continually improve is through small changes over time that compound into MASSIVE change. Some questions to ask yourself depending on your goal(s). Do I look visibly leaner? Do I look more muscular? Do my clothes fit better? Standard Ketogenic Diet (SKD) is what most think of as the ketogenic diet. The majority will utilize a standard ketogenic diet while avid exercisers and athletes might tend to gravitate toward the other 2 methods below. Targeted Ketogenic Diet (TKD) is your standard ketogenic diet (SKD) with carbohydrates consumed generally before and/or after exercise. Cyclical Ketogenic Diet (CKD) is when you alternate between periods of eating a standard ketogenic diet (SKD) and introduce 1-2 days of high carbohydrate intake. Let’s delve into each protocol a tad more, but briefly, to give you a better understanding of each. As previously mentioned, a standard ketogenic diet (SKD) is what most people think of or refer as a ketogenic diet. In general, it is a diet low in carbohydrate and moderate-high in both protein and fat. An SKD forms the foundation for both the TKD AND CKD. The targeted ketogenic diet serves as a compromise between your standard ketogenic diet and full-blown carb up (period of greatly increased carbohydrate intake) as used in a cyclical style ketogenic diet. (unlike a CKD, which is coming next) With a targeted ketogenic diet you would typically ingest a few fast digesting carbohydrates before and/or during and after your workout. Without delving too deeply into the intricacies of a targeted ketogenic diet, many people have reported having better energy levels and therefore more productive workouts by utilizing this strategy. Unlike a standard or targeted ketogenic diet, a cyclical ketogenic diet employs a full 1-2 day period of high carbohydrate eating with the goal of refilling muscle glycogen. Based on a standard 7 day week, you alternate 5-6 days of ketogenic dieting (SKD) with 1-2 days of high carbohydrate eating. Unlike the targeted ketogenic diet, a cyclical approach employs HIGH carbohydrate intake over the full course of a day or two (and possibly even longer). The carbohydrate scheduled days are usually preceded by a very intense and specific workout protocol. So the question now is how do you know if you’re in a state of ketosis? While there are actual test methods (blood, urine, breath), there are also telltale signs that don’t require any testing. For a variety of testing methods visit my article on how to measure ketosis. It’s possible to test for ketones in the urine, blood, and your breath. There are drawbacks to each, but as previously stated, unless you have an underlying medical condition that requires that you stay at a certain level of ketones, it may be unnecessary. In the end, we are big advocates of testing, at least in the beginning to draw any correlations to weight, mood, and/or performance related to ketone levels. We’re also just big analytical data nerds. Also, note that for certain individuals, eating under 100 grams of net carbohydrates is sufficient to reach a state of nutritional ketosis, but for others, they may need to go as low as <20 grams. This is why testing can be beneficial since everyone responds and is affected differently. 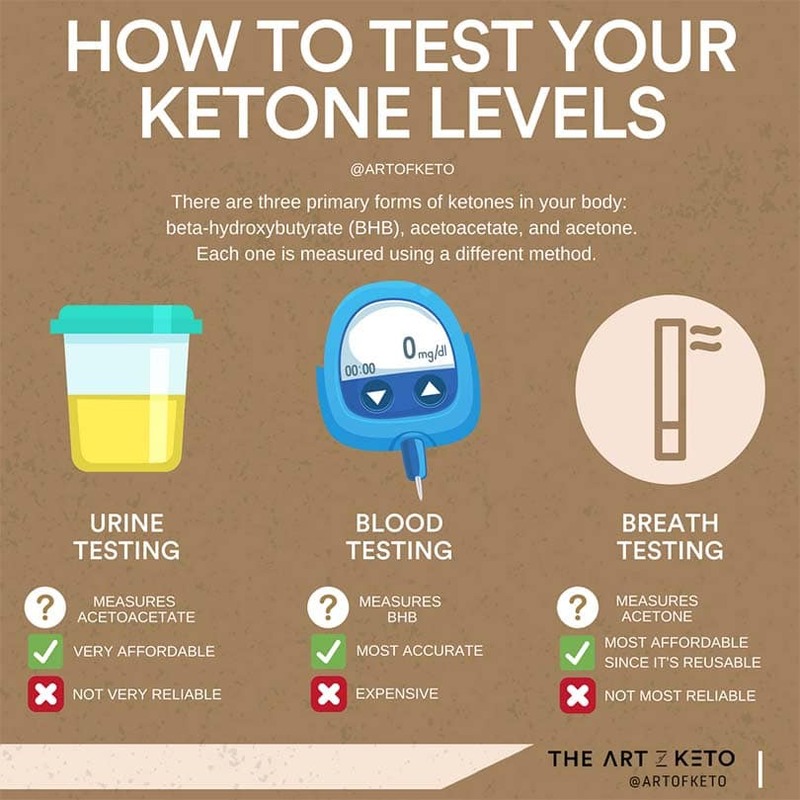 Bottom line – it’s not necessary to test for ketones depending on the person, it may even lead some to become obsessive with constant measuring. Read more about How to Measure Ketosis. On to the different test methods. Blood ketone meters are considered to be the “gold standard” as they are the most accurate way to measure your level of ketosis. It uses beta-hydroxybutyrate (a type of ketone body) as the indicator for this test. Only measures levels in your blood vs actual utilization. You must prick your finger to produce a drop of blood for measurement. By far, the cheapest and easiest method to measure ketosis is via urine strips. You can find these at your local pharmacy such as CVS or Walgreens or order them on online sites such as Amazon. I do apologize for folks outside of the U.S. since I am unfamiliar with the popular chain pharmacies… but I am sure you can grab these at your local pharmacies as well. The urine strips are likely the first option for most beginners. You simply hold the sticks in your urine stream for a few seconds and watch it change color. Then, you compare it to color on the side of the bottle which corresponds to a ketone level. Not very accurate, especially the longer you are in ketosis. Hydration levels can give you different readings. Breath meters measure the level of acetone in your breath which gives you an indicator of actual fat utilization. While not completely conclusive, this method may give you more real-time indicators of how different lifestyle factors and dietary changes affect your state of ketosis. Unlike urine or blood testing, the breath analyzer is reusable and can potentially save you money over time. Each method of testing will help you gauge your ketone levels, however, when used separately, does not paint the whole picture. There is no conclusive evidence that more ketones equate to more fat loss or more muscle gain. However, higher ketone levels generally have more therapeutic benefits in the treatment of certain medical conditions. Once you’re keto-adapted (fat-adapted) and your body becomes more efficient at utilizing ketones, you might not see the big numbers on your measuring devices that you once saw in the beginning of your ketogenic journey. (basically… be intuitive, which we should all strive for). Below are some physical signs many people on ketogenic diets have experienced. Many individuals, myself included, experience a marked reduction in hunger. In fact, some people who used to have bottomless pits report feelings of satiety with less food. 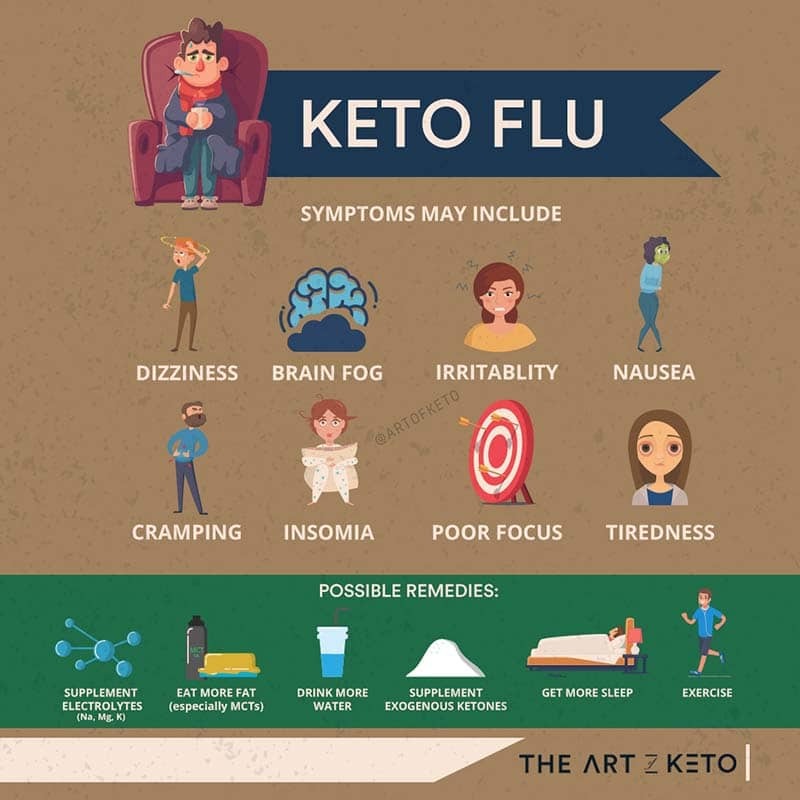 Depending on the individual, for the first few days (or weeks) during the acclimation period, you might feel tired aka “keto flu”. This is your body learning to use fat vs carbohydrates for fuel. After the hump people experience a clear increase in their energy levels. Some even report a sense of euphoria and mental clarity. It goes to show, sometimes we’re so used to feeling bad and having the dreaded “brain fog” that we don’t realize how bad it is until we experience what it’s like to feel good. You may have heard about the dreaded ketone breath. It can make a person’s breath smell “fruity,” or like nail polish remover. As the body burns through stored glucose (glycogen) you’ll be excreting a lot of water in the process. When insulin levels are kept low, the kidneys excrete sodium at a higher rate which also leads to additional water loss. This is why it is important and suggested to increase sodium while following a ketogenic diet. The key factor in reaching ketosis is the restriction of carbohydrates. In theory, the lower the carbohydrate intake, the greater degree of ketosis. In fact, the fastest way to nutritional ketosis is simply to fast. Fasting for 24-72 hours will get you into a state of ketosis the quickest. For everyone else, it is generally advised to stick to under 20 grams of net carbohydrates per day to allow for adaptations to take place. As a general rule, you want all your carbohydrates from low GI sources such as vegetables with trace carbohydrates coming from nuts and dairy. Just about any meat, especially organ meats (liver, tongue, heart, etc) as they are highly nutritious, is fair game. This will include beef, poultry, bison, fish, eggs, etc. All the drinks listed below are unsweetened, but if sweetened with the above-listed sweeteners they are permissible. Small amounts of wine and hard liquor may be permissible, though generally not recommended during the adaptation period. For a more complete list of keto-friendly foods to incorporate in your diet and what to avoid, give our KETO FOODS LIST | THE ULTIMATE GUIDE a read. In most cases, you generally want to avoid all starchy and refined carbohydrates. Grains – rice, corn, wheat cereal, etc. Sugar – any caloric sweetener such as honey, agave, maple syrup, etc. Tubers – Potatoes, yams, sweet potatoes, etc. Failing to plan is planning to fail. When you begin your ketogenic diet, you will want to plan ahead. Try to keep things as simple as possible in the beginning by eating foods that not only you enjoy, but provide satiety. Once you become keto-adapted or have been on the diet for a while, feel free to experiment with different foods and/or carbohydrate intake to see how it affects you. I'll be the first one to say that what works for one person may not work for the next. If you decide on a keto diet and bodybuilding as your plan of attack, the best thing you can do is EXPERIMENT. Every day is a chance to learn about yourself, your body, and make adjustments based on real-world results. I believe a ketogenic approach is a great compromise between optimal health and aesthetics. That said, I guess that makes it 6 tips. There are plenty of misconceptions when it comes to the ketogenic diet and physical performance. While, in the short term, there may be small performance drops during the adaptation period, there are many promising longterm benefits from switching to a fat burning athlete. In keto-adapted athletes, energy efficiency is increased. Meaning, at almost any given intensity of their V02max, they are utilizing more fat and less glycogen than their sugar-burning counterpart. In fact, fat-adapted athletes have been shown to burn up to 2.3 times more fat at peak oxidation 8Metabolic characteristics of keto-adapted ultra-endurance runners. Volek et al. 2016 59% more fat overall than non fat-adapted athletes, AND at higher intensities. As a result, there is less of a dependence on stored and/or external carbohydrate sources during exercise. Instead, glycogen is spared and stored for when we really need it, such as during higher intensity periods of activity. This is crucial as we only store about 2400 calories worth of carbohydrates within our muscles and liver, while even the leanest of individuals may carry tens of thousands of calories of body fat. Energy stores become virtually limitless on a ketogenic diet. Common for those new to keto or low carb, but often fades after a few days. While your body is transitioning primarily from sugar burning to fat burning people have reported bouts of fatigue, dizziness, headaches, cramps, etc. This is often in part due to a loss of electrolytes. When you stop eating foods rich in carbohydrates, you’ll start to drop excess water and salt which may result in dehydration and the aforementioned symptoms. You can minimize or mitigate dehydration completely by increasing your water and salt intake. As with the keto flu, muscle cramps are typically a result of a loss of electrolytes. Aside from adding additional salt, make sure to eat foods rich in potassium and magnesium such as dark leafy greens and avocados. You may want to also supplement with magnesium or potassium if you prefer to go that route. One of the most common causes of constipation is dehydration (starting to see the trend here?) The simplest solution is to increase water intake and make sure you intake an adequate amount of fiber from non-starchy vegetables. Also of note, you may be eating less “bulk” due to cutting out all the carbohydrates and processed foods you may have been eating previous to going keto. As a byproduct, you will likely have less waste. Try not to confuse constipation with just not having the urge to go number two. Some people experience the smell of acetone on their breath (or more often, the people around them do) This, in part, is due to acetone being one of the ketone bodies created during ketosis and often resembles the smell of nail polish remover. 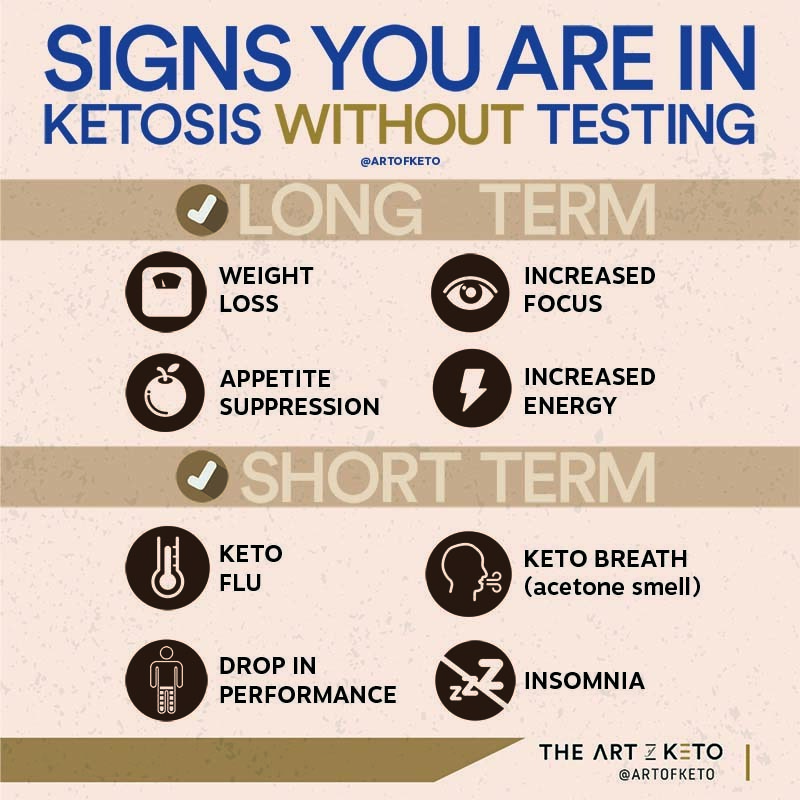 This typically goes away for most individuals within 1-2 weeks after the body adapts to ketosis and stops inefficiently expelling them through the breath, sweat, and urine. While there is no real scientific reason or explanation for the keto rash, a handful of people report bouts of rashes appearing once starting a ketogenic diet. As with the keto breath, this may be due to skin irritation from the acetone excreted through sweat. Another theory floating around is that the rash is a sign of toxins being released through the skin. Since toxins are primarily stored within the fat cells and we are now mobilizing more fat and using it as our primary source of energy… the toxins are also being circulated and excreted out through our skin. Possible solutions include loose-fitting clothing, showering immediately after exercise, and even possibly upping carbohydrate intake slightly. There is a site which delves more into this in depth. As you can see, most of the issues are related to dehydration which also leads to a lack of electrolytes. You want to ensure that you're drinking enough water, salting your foods liberally, and supplementing with additional electrolytes if you are engaging in substantial bouts of exercise or just tend to sweat more than the average. Also, we would recommend keeping food choices basic at first before trying to re-create all your favorite food dishes in keto friendly versions. This means sticking to fatty meats, eggs, healthy oils, nuts, green leafy vegetables, etc. As you can tell from a lot of the “side effects” mentioned, a lot of it boils down to dehydration and electrolytes. You may get them from foods or supplement them in your diet. The above links are what we personally use here at The Art of Keto. When people track their food intake, they usually eat less (or more if weight gain is your goal) and are more likely to keep the weight off long term. It’s also easy to over-consume carbohydrates as they are hidden in just about everything. Keeping a food log keeps your accountable regardless of your goals. A common concern we hear about ketogenic diets is that they are more expensive in general compared to other ways of eating. An excellent grass-fed steak does cost more than a cheeseburger from the local fast food joint, but a ketogenic diet isn't as expensive as you may think. Also, grass-fed meats aren't a requirement for this diet, but if you have the means to afford to do so, then we would recommend you opt for grass-fed over grain-fed. In the end, I would much rather invest in my food quality and nutrition now then all the costly medical bills from a lifetime of subpar dietary choices. With that said, a ketogenic diet doesn't cost more than any other “healthy” diet lifestyle. You may even find that you will spend less money and time overall when you fall into a groove and follow the tips below. I don't know about you, but I get weekly mail from the all of the local grocery stores with the latest savings. Not only that, but almost every grocery store now has their own app now with coupons and the most current deals. Don't hesitate to talk to your local butcher and ask if there is anything not on display or if you have any special requests. You'd be surprised how often you can find some hidden gems. Costco is your friend. Buying food in bulk can reduce the cost per pound tremendously. Off the top of my head, you can buy hard cheeses, grass-fed butter, lots of veggies, and proteins such as steak and canned salmon from many food wholesalers. People in the fitness industry are no stranger to Meal Prep Sundays. While it may seem convenient to buy pre-made food or eat out, the costs add up (both time and money). Try cooking your veggies and proteins ahead of time. We like to prep our food twice a week, so we always have a fresh easy to grab meal ready to go. Meal prepping is also a great way to set yourself up for success as we sometimes don't make the best food choices if we find ourselves tired after a long day of work and don't want to cook. I hope you enjoyed the ketogenic 101 guide. What did you think of it? Or maybe you have a question. Either way, let me know by leaving a quick comment below right now. Founder of The Art Of Keto. Handcrafted with · Powered by Ketones.